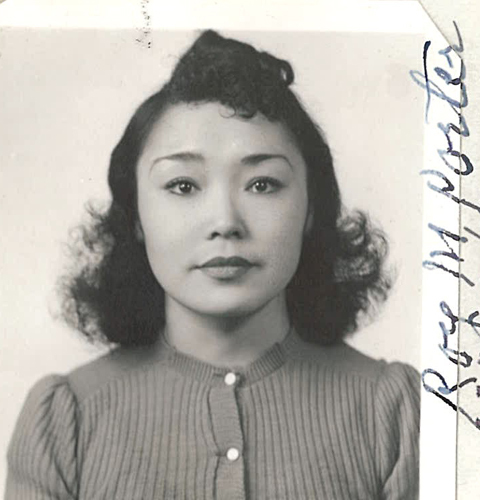 “Form 430, Photo of Mabel Kegiktok Long,” 1939, Chinese Exclusion Act case files, RG 85, National Archives-Seattle, Long Mabel Kegiktok case file, Seattle Box 784, 7030/11925. Mabel Kegiktok Long was born in Nome, Alaska on 4 June 1905. When she was twelve years old she came to Seattle with a missionary couple, Mr. and Mrs. Baldwin. After Mr. Miller, the Secretary to the District Attorney at Nome, was appointed her guardian she also spent time in Oklahoma and Texas, then lived with Mrs. Hamlin in Illinois, and finally went to live with Dr. and Mrs. Rigden, in Danville, Indiana. She attended the Friends Private School in Washington, D.C. before returning to Danville to attend Central Normal College where Dr. Rigden was president of the college. After college Mabel returned to Seattle then visited her mother in Nome in 1924. At some point she took the surname of her guardian and was known as Mabel Mae Miller. Mabel’s father was Charley Long (marriage name Dong Hop Long) a full-blooded Chinese. He moved back to China in the late 1920s. Her mother was Lucy Otongana, a full-blooded Eskimo who was born on Diomede Island, Alaska. Mabel first met her father in 1924 in Seattle. Her father’s friend, Chin Ben, arranged the meeting. She always thought she was full-blooded Eskimo and was shocked to see that her father was Chinese. In 1939 Mabel testified that her mother told her that Father La Fortune had married her parents at the Catholic Church in Nome in 1903 or 1904. They were divorced a year or two later and Mabel had no memory of her father. A few years later her mother married Frank Martin in Nome and they had eight children together. Mabel had been married twice. Her first husband was Harry Fong Lee. They had a daughter, Joan Lee, born 15 August 1930 in Vancouver, Washington. Mabel and Harry divorced in 1935 and she married Clarence C. Coble, a Caucasian of German and English ancestry, on 7 September 1935 in Seattle. Clarence was a movie projectionist. Mabel was a dancer and worked with the Fisher Booking Agency in Seattle. In 1939 she was applying for a return certificate to visit Canada for a week’s engagement at a night club. The certificate would enable her to cross the Canadian border and return to the United States a week later. Chin Ben (marriage name Sui Wing) was a witness for Mabel Kegiktok Long’s application. He was a friend of her father and knew her from the time of her birth. A 1939 transcript of her certificate of birth is included in the file. Her mother swore in an affidavit that her daughter’s birth wasn’t recorded at the Recorder’s Office because in 1905 there was no systematic record of birth kept throughout the Territory of Alaska. She stated that the records of the Catholic Church in Nome and the Probate Records of the Cape Nome Precinct, Nome, Alaska where W. R. Miller was appointed guardian of Mable, agreed with the affidavit. Mabel’s application was approved but there is no indication in the file that she made the trip to Canada. The reference sheet in the file includes the names and file numbers of Mabel Kegiktok Long’s father, uncle, step-mother, step-brother, and witness Chin Ben.